Looking for Skyworth TV remote codes? I’m trying to set up my cable/satellite/universal remote to work with my Skyworth television. What is the manufacturer’s code for my Skyworth TV? 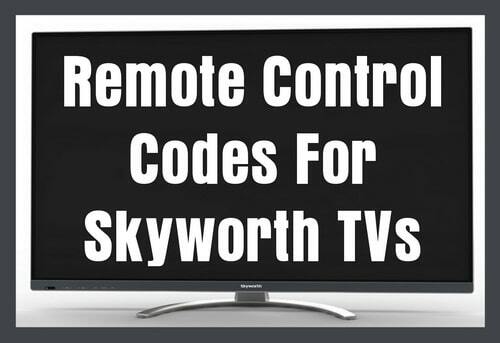 If you have recently bought a universal remote control and you need the remote codes to operate your Skyworth TV or Skyworth TV/DVD Combo, we have codes below for your TV. These 3, 4, and 5 digit codes will work with universal remote controls. If the first does not work keep trying the numbers down the list. If there is another code listed for Skyworth in your universal remote control guide, please try that code. Refer to the Remote Control Guide under your TV’s model number if needed. Need other Skyworth TV remote codes? Please ask us below and we will get you the codes needed to program your Skyworth TV. I have a RCR503BZ 3 in 1 remote trying to control a skyworth tv/DVD combo I got the TV code but can’t find the DVD code is there one code that controls both or separate codes if there is what is the code for the DVD player. Need a 4 digit code for Skyworth 58 inch TV. Skyworth 32E360 3 digit remote control codes. My new remote control is a Chunghop rm-139es. Thanks for your help but it did not work for my new tv. I have now a Skyworth 65E6000 and a remote control tv one for all URL 11 2981. Could you tell me if it is compatible? If so what is the 4 digit code i have to use? I have a Skyworth TV/DVD model is SLC2219A3S. Trying to get code for a GE universal remote. I have tried all of codes above… any help would be appreciated. 531 remote code should work with your Skyworth TV/DVD model SLC2219A3S using your GE remote. If not try using Symphonic or Funai TV remote codes.